The role of the testing team is to make sure that all components of our vehicle work the way we want them to. This year with WR6 being retained as a test vehicle, we are planning to test several new developments that aren’t quite ready for full competition implementation. A secondary function of the Testing team is to prepare the team for competition by practicing entry examinations, as well as running practice versions of competition static events. Warwick Racing is committed to performing well both on, and off, the track. As a result, the testing team works closely with both technical, and business team members. Previous years have struggled to comfortably comply with noise regulations at UK competition. Our aim is to make sure our vehicle noise output is not only able to comply with current regulations but also any anticipated noise limit reductions in the future as electric vehicles become more prominent in the competition. Side pods in the past have purely been for aesthetic appeal on our cars. This year we plan to make them more functional by using them to direct airflow through and around the cooling system, in essence making the car more efficient. Warwick Racing have never previously implemented anti-roll bars. 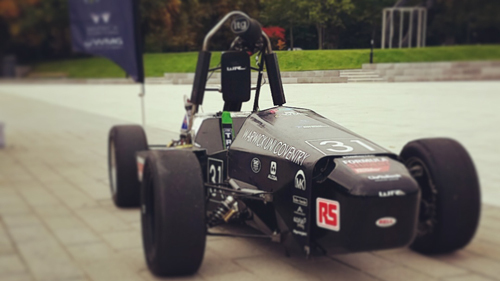 This year we have a dedicated team in dynamics researching suspension and anti-roll bars with the aim to have a prototype designed, manufactured, and tested by the end if this academic year. The research from this team will allow for a better handling car not just this year, but in future years. The foundations for wireless data acquisition and traction control were put in in place last year’s electronics team. This year, the data acquisition system is being completed and the traction control is being expanded to take readings from all four wheels – this will provide us with a far deeper knowledge of our cars performance than any other previous year. The ability to analyse the cars performance live also allows us to perform better at competition by relaying more useful instructions back to the driver based on the data we can obtain.